Caloundra Motors has had a long and solid history in the local area. It first began in the early 1930s as a mechanical repair business in the main street of Caloundra. In 1980, the business was moved to Kings Beach by the owners Grandson, Robert Smith, and his wife Glenda, and began operating as Kings Beach Service Centre. The business had a strong local reputation providing old fashioned driveway service, fuel, mechanical services and repairs. They have been affiliated with RACQ for just as long. 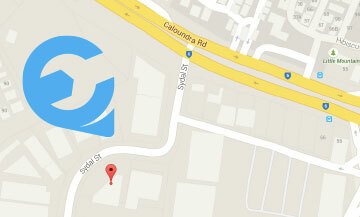 At the end of 2016 the business was moved to 3 Sydal Street in Caloundra to provide better geographical coverage for the breakdown service and to allow for growth. The business was also re-branded back to the historical Caloundra Motors to better suit the new location and a way to acknowledge the strong ties to Caloundra, and the contributions made by generations past that assisted in the success of the business today. In April 2018 the business was sold to long time employee, Glen Morris, who completed his apprenticeship at Kings Beach many years ago. Together with his wife Leisha, Glen has taken care of the day-to-day management of the business for many years, which includes the provision of the RACQ roadside assistance service for the Caloundra area and the management of the automotive repair workshop. Leisha also has historical ties with Caloundra Motors as her Father completed his apprenticeship at the original Caloundra Motors with Robert’s Grandfather. It is an exciting chapter for the family business. Caloundra Motors Service Centre aims to continue providing the good old fashioned service to the local area that the business has grown on from times gone by.